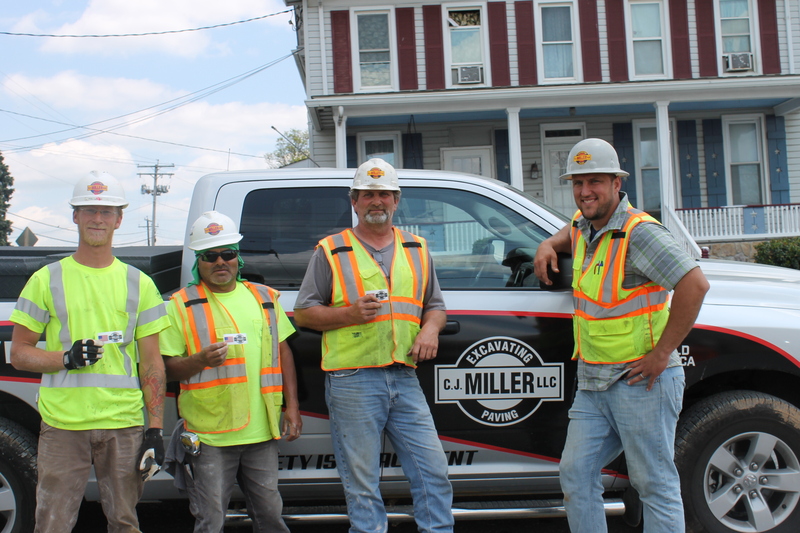 Working in the construction industry for a site contractor, CJ Miller employees do find themselves putting out proverbial fires. 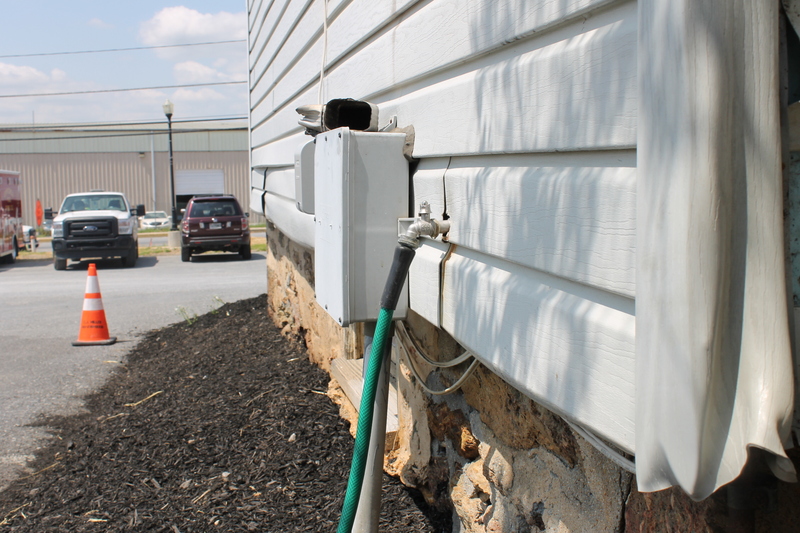 But mid-afternoon on May 2, several CJM employees working our Hampstead Streetscape Project jumped in without hesitation to put out an actual fire. Fine grade Foreman Chad Snyder’s interest was first sparked when he saw a gentleman in his personal truck entering the job site area at a high rate of speed. It turns out the gentleman was an off-duty fireman wearing a Station 43 T-shirt, who had seen flames coming from a home as he was driving by the work zone. 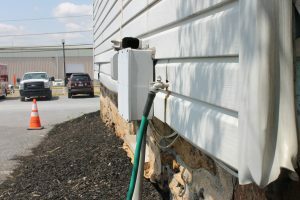 The fire had started in the mulch area outside of a home owned by Mike Illiano and was nipping at the siding when the fireman and Chad worked to extinguish the fire with a burned garden hose. CJ Miller employee Phil Larose, who earlier this year helped a woman who slipped on the ice, quickly appeared on the scene to help as well. Phil, a seven-year volunteer with the Nashville Volunteer Fire Department in Spring Grove, Pa., originally saw smoke and figured someone was barbecuing. 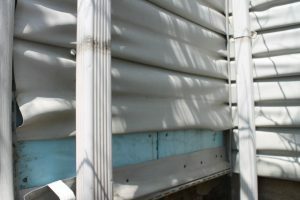 Then he saw the side of the house. He and CJM Pipe Layer Alberto Tellez ran over to help. The group worked together using the hose and raking over the mulch to extinguish the fire over a several-minute period. Phil and the other fireman checked behind the siding to verify the fire was fully extinguished. Photos illustrate some of the damage done to the siding of the home. “We were just at the right place at the right time,” Phil said. 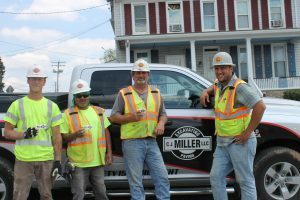 As a result of their willingness to quickly jump in and help, the CJ Miller employees were awarded special safety stickers to place on their hard hats. CJM employees Phil Larose (from left), Alberto Tellez, and Chad Snyder are presented safety stickers by Hampstead Streetscape Foreman Jake Orndorff.